Regardless of what types of activities you enjoy with your family, there is bound to be something you’ll enjoy and that will fit your budget this holiday season in the Greater Atlanta area (and beyond). Below, we’ve compiled one of the most extensive lists out there for family-friendly winter holiday activities! *Drive times are estimated from the center of Smyrna, to the center of hosting cities, not including traffic. ** In many cases, the price range reflects the off-peak child rate through peak date adult rates. For pricing on a specific date, please check the websites provided. Also, this is just the first round! We’ll be updating through November and December as more events are promoted, so please check back often. While there are many holiday events that are worth the drive into the city or surrounding areas, you don’t have to travel far to get into the Christmas spirit. Don’t miss these great events here in Cobb County. Winter Wonderland, Marietta Square. November 20 – January 4, Glover Park. Marietta is going all out for the holidays this year. In addition to their tree lighting and Santa’s Workshop during the weekends, this year they will also have an open air ice rink and an all-day New Years’ Eve event with activities for the children during the day and then music and a midnight ball drop at night. You can keep up with events on the link above or their facebook page. Coming Home For the Holidays. December 1, 5-8pm, Village Green, Smynra. Watch Santa light the big Christmas Tree in the middle of the Village Green at 7:00 p.m. and transform downtown Smyrna with brilliant lights. 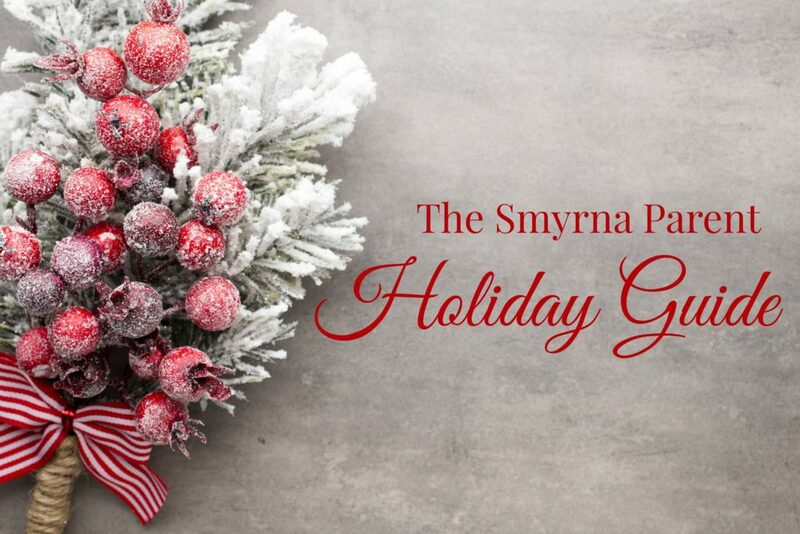 Enjoy holiday festivities, musical performances by local church and school choral groups, activities for the kids, parade and a visit with Santa at the Smyrna Community Center. This annual event marks the beginning of lights in our downtown which can be enjoyed nightly through the holidays. The Avenue at West Cobb Holiday Celebration: December 2, 3pm – 7pm, The Avenue at West Cobb. Enjoy holiday music, complimentary horse drawn carriage rides and photos with Santa. Vinings Jubilee Christmas Tree Lighting. December 3, 6 – 8pm, Vinings. This FREE family-friendly event is a spectacular way to kick off the holiday season with food, fun and pictures with Santa! Holiday music, Holiday Express train rides, face painting, family activities and of course photos with Santa. Santa House at Aunt Fanny’s Cabin, Smyrna. Weekends in December (starting December 4), with a special appearance on Monday, December 21 and Tuesday, December 22 for last minute gift requests. Young Children and the young at heart may hand deliver Christmas Wish Lists to Aunt Fanny’s Cabin (located on Atlanta Road across the street from the Market Village) and have a private conversation with the jolly old elf himself. See link for times. This event is co-sponsored by the Smyrna Optimist Club and the City of Smyrna. Christmas House Arts and Crafts Show, December 4 – 13 at Mable House Arts Center, Mableton. Select from hundreds of unique handmade items displayed in a beautiful holiday setting. There is something for everyone! A Day with Santa & Lighting Festival. December 5, noon, Depot Park, 2828 Cherokee Street, Kennesaw. The festivities begin at noon with a parade on Main Street featuring costumed characters, designer floats, marching bands, and live reindeer pulling Santa’s sleigh. The entertainment will continue with a holiday host of activities, live music and dance performances; along with a seasonal variety of food vendors, crafts, gift and general merchandise near the Depot. Festivities will conclude with a Christmas tree lighting program which begins at 6 p.m. Children’s activities include FREE snow tubing down “Depot Hill”, a FREE snow playground, inflatables and amusements, kid’s crafts, visits with Santa, stage entertainment, and a holiday market full of gift ideas and unique merchandise. Food vendors will be onsite. Candy Cane Hunt. December 5, 10am – 12pm. Mable House (Mableton). Bring the whole family for some outdoor holiday fun on the grounds of the Historic Mable House. Activities include cookie decorating, crafts, marshmallow roasting, photos with Santa and of course the Candy Cane Hunt complete with prizes. St. Nick’s Cafe “All Through the Houze” Saturday, December 5th, at 9am, 11am, 1pm at The Art Place – Mountain View. St. Nick’s Cafe 2015 a family tradition for over 20 years that includes a meal, show, a visit with Santa, and a handmade ornament for the kids! Prices for tickets for all ages is $12. Show times are 9am Breakfast, 11am Brunch/Lunch and 1pm Lunch! This year’s show is an encore presentation of the original staff play “All Through the Houze”. The Houze teens are not into the holiday spirit like their Dad wishes, but Santa and some of the reindeer save the day! A sweet comedy for adults and youth alike. All meals provided by Jason’s Deli. Nutcracker Highlights in Smyrna, December 13, 4pm, Campbell High School Theater. The International City School of Ballet, in partnership with Smyrna Parks and Recreation, present a performance of Highlights of the Nutcracker at the Campbell High School Theater in a festive program of excerpts from Tchaikovsky’s classical ballet, performed by pre-professional students. It is a wonderful way to get into the spirit of the season and enjoy this timeless ballet with a unique twist. Tickets must be purchased in advance here or at the Smyrna Community Center. Price: $10 adults and $5 children. Christmas at Brawner Coat Drive, December 18, 5pm – 8pm, Taylor-Brawner Park. This is a chance to get a taste of the season and give the gift of warmth. Join us at Taylor-Brawner Park and Brawner Hall with a giving spirit and enjoy holiday activities, too. Look for more information at www.SmyrnaCity.com as December approaches. Ice Skating (outdoors!) at Centennial Olympic Park, Atlanta– November 21 – January 10, 2016. Price: $12/person for a 90 minute session. Enjoy Centennial Olympic Park’s Holiday in Lights display while you’re there. Ages: Best for children 4+. Drive time: 30 minutes. Skate Atlantic Station, Atlantic Station, Midtown– November 21 – February 14, 2016. General admission: $13/person. Best for children 4+. Drive time: 20 minutes. Atlanta’s largest holiday skating rink. Astor Holiday Ice Rink at St. Regis Buckhead – November 21 – January 3, 2016. $30 per hour for adults & $18 per hour for children under 16 plus tax. Hours vary, please see website. Children’s private skate parties also available! Snow Mountain, Stone Mountain– November 21 – February 28, 2016. Tube down a mountain of snow, kids can build snowmen and igloos, and roast marshmallows. There are high minimums on Avalanche Alley, but there is a smaller hill just for the smaller kids. Price: Starting at $28/person + $10 parking. Advance reservations are required. Ages: All. Drive time: 45 minutes. Atlanta Ballet’s Nutcracker, The Fox Theatre. Shows run December 11th-27th. Price: Starting at $32/ticket. Ages: Best for children 4+ and generally viewed as a family event, but the run time is 2 hours, so take that into account when deciding if your child is old enough to sit through it. Drive time: 30 minutes. Rudolph The Red-Nosed Reindeer Puppet Show, Center For Puppetry Arts, Atlanta– November 12 – December 27. Check link for exact dates and times. Live puppet theater performance based on the classic TV special. Rudolph soars back into town for this faithful adaptation of the wonderful holiday tradition that speaks to the misfit in all of us! Ages: 4+. Drive time: 30 minutes. Macy’s Pink Pig, Lenox Square Mall, Atlanta– October 31 – January 3 (but closed Thanksgiving and Christmas Day), hours in link. A classic Atlanta holiday (train) ride since the 1950’s. Price: $3/ride (discounts available for more than one ride). Ages: All. Drive time: 30 minutes. Festival of the SEAson, Georgia Aquarium, Atlanta– November 21 – December 25.Festival of the SEAson transforms Georgia Aquarium’s plaza, galleries and exhibits into a winter wonderland! 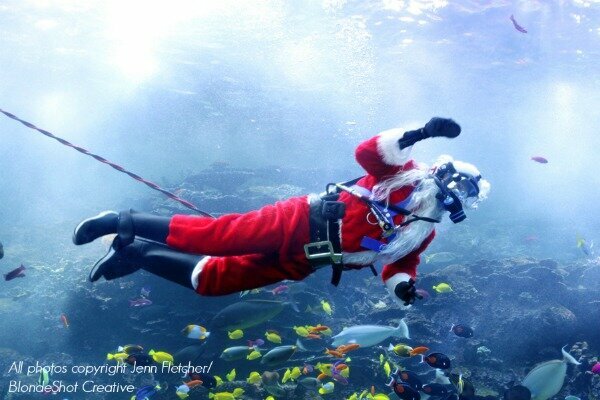 This year, we’re celebrating the holidays with a spectacular light and music show, appearances by Santa and SCUBA Claus, a holiday edition of our live entertainment experience, tree-lighting ceremonies, Santa Claus events, and a new ocean-themed 3D projection mapping video. Ages: All. Drive time: 30 minutes. Reindeer Day, Chattahoochee Nature Center, Roswell– December 13th, 1:00-4:00pm. Don your holiday hats and get your jingle bells ready! A CNC winter tradition returns for its 5th year. Come out for a day all about winter animals and holiday cheer. Join us for these fun activities; straight from the wintery north (North Cobb that is) meet live reindeer that bring the magic and tradition of the holidays alive for the entire family! It wouldn’t be the holidays without Santa Turtle. Our own Celebrity Box Turtle will be roaming throughout the afternoon. Be sure to have your camera ready! The young and young at heart will enjoy sitting down to CNC’s unique story time at 1pm. This interactive show is full of laughs and lessons about the wonders of winter. Ages: All. Drive time: 35 minutes. Santa’s Wonderland, Bass Pro Shops, Lawrenceville– November 14 – December 24. The most wonderful time of the year is almost here! Gather the family and come to experience the joy of a classic Christmas. Stay for FREE games, crafts, and activities that celebrate the season. Price: Free. Ages: All. Drive time: 50 minutes. Winter Wonderland Celebration Day, Fernbank Museum, Atlanta– November 20 – January 10, 2016. Prepare to ooh and aah over two floors of twinkling, beautifully decorated trees showcasing celebrations around the world in the enchanting Winter Wonderland exhibition. Twinkling with lights, glimmering with color and shining with a variety of cultural objects, more than 30 trees and other displays recognize the diversity of celebrations, holidays, traditions and events from around the world. Price: Regular museum admission, $16-$18, 2 and under free. Members free. Ages: All. Drive time: 30 minutes. Winter Adventure at LanierWorld, Lanier Islands. Enjoy a brand new adventure this year with Winter Adventure: a snow-packed winter playland perfect for building a snowman, delightful tubing and thrilling sledding! Winter Adventure is the perfect adventure for the family that will keep them thrilled throughout the day. We’ve transformed the summer landscape of LanierWorld and made it ready for winter! Where else can you zoom down slides on sleds and snow tube in a wave pool? We’ve also created large snow play areas where you can build a snow fort and defend it with an army of snowmen and snowballs. Price: $25 – 35, note that this is different from Magical Nights of Lights, though you can purchase ticket packages for access to both. Ages: All (2 and under are free). Drive time: 1 hour. Fantasy in Lights, Callaway Gardens, Pine Mountain– November 13 – January 2. Drive-thru light display. Callaway Gardens’ Fantasy In Lights is not only the South’s most spectacular holiday light and sound show, it is one of the world’s “Top 10 Places to See Holiday Lights,” as named by National Geographic Traveler. Price: $8.50-$28/person. Ages: All. Drive time: 1 hr., 30 minutes. Magical Nights of Lights at Lake Lanier, Buford– November 21 – January 3. Magical Nights of Lights continues when the sun sets on Lanier Islands this holiday season. Twinkling lights come to life, transforming the landscape with pictures of Christmas wishes, millions of bulbs color the Islands throughout the holidays at our Magical Nights of Lights. Journey to Santa’s Holiday Village, where kids can share their Christmas wishes with the big man himself, and grab a photo memory of their special meeting. While you’re here, shop for that special Christmas gift for someone in your circle of friends and family. In December, a live nativity, presented by area churches, adds a special touch to your Christmas celebration. Tune in with your smart phone or radio to hear songs of the season and enhance the experience with our brand new companion app! The magic is back at Lanier Islands. Price: Start at $17-$28. (Winter Adventure not included in this price, but packages are available). Ages: All. Drive time: 1 hour. Lights of Life, Marietta– November 26 – December 31. Drive-thru light display, petting zoo, train rides, pony rides, live music (weekends), and Santa. This year you can also participate in a fun run or 5K on December 4 and 5 for a chance to run the Lights of Life. Price: Starting at $5 – $10/car depending on day + a la carte add ons. Ages: All. Drive time: 10 minutes. Garden Lights, Holiday Nights. Atlanta Botanical Gardens, Atlanta– November 14 – January 9, 2016, 5-10pm. Garden Lights, Holiday Model Train Show, Ride-on Train, meet Santa, and S’mores. Price: $8-$20/person, under 3 are free. Ages: All. Drive time: 30 minutes. Smyrna Parent posted a review of this event last year. 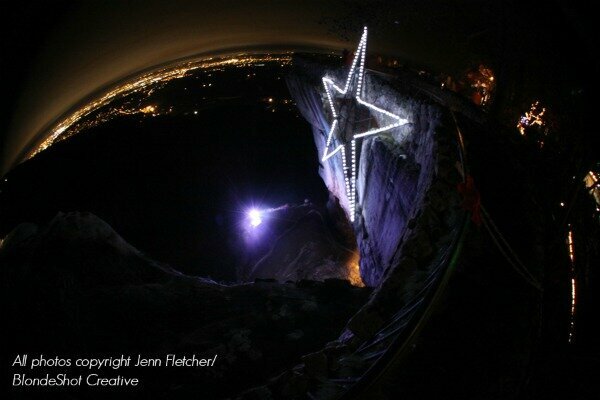 Stone Mountain Christmas, Stone Mountain– November 7 – January 3. Lights, live shows, train ride, nightly parade, fireworks, character meet-and-greets, and more. Price: Starting at $19.95/child and $25.95/adult + $10 parking. Ages: All. Drive time: 45 minutes. Holiday in Lights, Centennial Olympic Park, Atlanta. November 21 – January 10, 2016. Centennial Olympic Park’s annual Holiday in Lights is an Atlanta tradition. In November, the Park transforms into a winter wonderland with thousands of lights that make up the sparkling display. Price: Free. Ages: All. Drive time: 30 minutes. Holiday in the Park, 6 Flags Over Georgia – November 21 – January 3. More than one million LED lights and dozens of Christmas trees will create the perfect magical atmosphere this holiday season. Rides will be open during this extended season. Price: Starts at $41.99. Ages: All. Drive time: 25 minutes. Christmas Lights at Pettit Creek Farms, Cartersville– Drive-thru light display, live reindeer, hayride, petting zoo, and Santa. Price: $15 for a vehicle or $12 for a hayride. Ages: All. Drive time: 1 hour. Lights of The South, Grovetown– November 20 – December 30, except Christmas Day. 6pm – 10pm. Lights, lighted Christmas tree maze, train, hayride, roast marshmallows, and Santa. Price: $6 – $9/person. Ages: All. Drive time: 2 hr., 30 minutes. 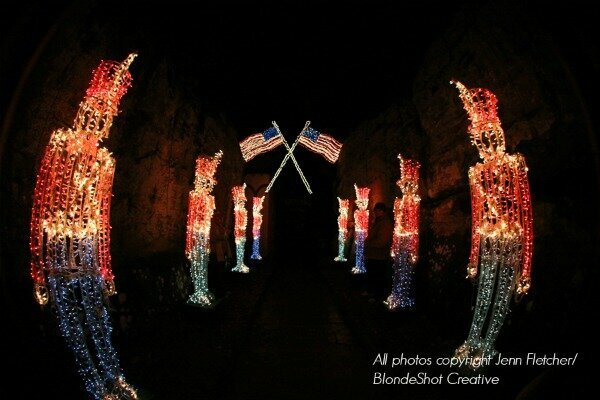 Enchanted Garden of Lights, Rock City, Chattanooga, TN– November 21 – January 3. Walk-thru light display, gingerbread cookie decorating, design a stocking, sugarplum fairy makeovers, live entertainment, meet Santa and other characters, warm fire pits, and optional dinner with Santa add-on. Price: $12-23/person, add $10/adult and $5/child to See Rock City. Dinner with Santa also available and already selling out! Children under 3 free. Ages: All. Drive time: 1 hr., 50 minutes. Smoky Mountain Winterfest, Pigeon Forge, Gatlinburg and Sevierville, TN- Late fall – early March. Within this larger festival, there are other many holiday specific events, including light displays, festivals and more. See website for more details. You can also plan your trip by checking out more information about Smoky Mountain Park here and cabin rental information here. The Polar Express, Great Smoky Mountains Railroad, Bryson City, NC– 1 ¼ hour round trip excursion, warm cocoa and the story, sounds from the motion picture, Christmas carols, and receive a silver sleigh bell from Santa himself. Reservations required. Price: $10-$74 depending on age, date and class selected. Ages: All. Drive time: 3 hours. Santa Express or Nighttime Santa Train, Blue Ridge Railway, Blue Ridge, GA– November 21 – December 24. 1 hour or 4 hour (with a 2 hour layover) rides available. Visit with Santa and characters, sing carols, and children receive small gifts/mementos. Reservations required. Price: $24-$40/person. Ages: All. Drive time: 1 hr. 30 minutes. Smyrna Parent reviewed this last year and highly recommend it! Read more here. North Pole Limited, Tennessee Valley Railroad, Chattanooga, TN– November 20 – December 26. 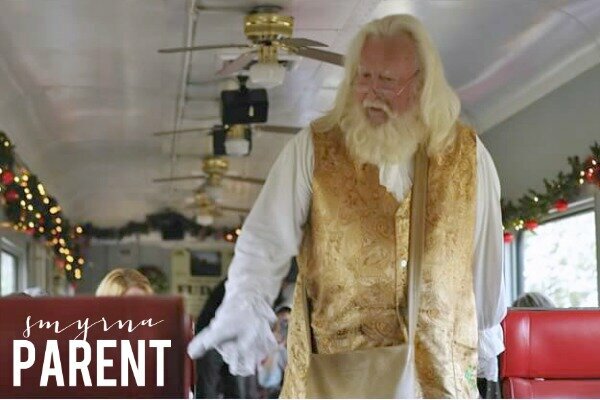 Train ride, storytelling, meet Santa. Reservations required. Price: $26/person or upgrade to Santa’s Private Car, $50/person. Ages: All. Drive time: 1 hr., 50 minutes. Still looking for more?? We have a calendar full of holiday-themed posts coming up, which will feature Photographs with Santa, a Guide to Local Charities, reviews of many of these Holiday Events, and Family-Friendly Holiday-Themed Theatre! If you’d like to see us cover something specific, please let us know: info@SmyrnaParent.com.